Lately, I've been reading up on crime and court coverage techniques. I came across a Web site with some pretty unsettling statistics of journalists who have died on the job. Right now, I cover some crime and courts for the Las Vegas Sun, and it's scary to think that I could die on an assignment but it's true. I was aware of this when I fell in love with journalism, and it's something I'll always carry in the back of my mind. Regardless, I love what I do and I'm willing to risk my life to relay important information to the public. Read below if you're considering a career in journalism. 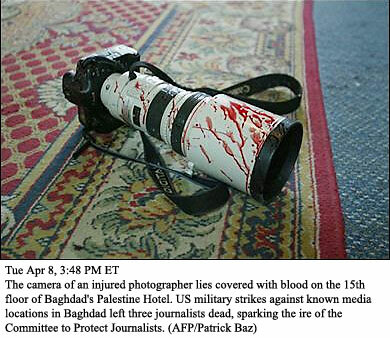 Journalists frequently are at risk while on assignment. The Committee for the Protection of Journalists (CPJ) says 389 journalists were killed while on the job from 1992 to 2001. Of those, 62 were killed in crossfire and 298 were victims of homicide. Fourteen of the victims were Americans, and only four of those were working in the U.S. while killed. In an infamous domestic case, Arizona Republic reporter Don Bolles was killed by a car bomb in 1976 as a result of his investigations of organized crime. Two men were convicted and sentenced to prison in the case. CPJ said at least 11 journalists since Bolles have been slain in the U.S. because of their work. In all but one case, the victims were immigrant journalists working in languages other than English. Journalists sometimes are arrested or injured while covering clashes involving law enforcement. In recent years, such incidents were reported at International Monetary Fund demonstrations in Seattle and Washington, D.C., and during the federal raid to seize the Cuban boy Elian Gonzalez in Miami. Some journalists have reported they were wearing proper identification when attacked by renegade police officers or units. In one recent case, a radio journalist covering the funeral of a man shot by New York police said he was assaulted and arrested on trumped-up charges. Crime reporters can face special safety concerns while on assignment. In 1984, a New York newspaper reporter was seriously beaten during an apparent robbery in Brooklyn. In some big cities, a few crime reporters on assignment use war-zone safety devices, including helmets, body armor or outer garments boldly marked MEDIA. But this strategy has been known to backfire. Over the past 35 years, journalists frequently have been targeted during riots. In 2002, several Minneapolis journalists were injured during rioting that followed the shooting of a child in that city by a police bullet that ricocheted. A TV vehicle was torched, and several journalists were attacked. A similar scenario occurred in that city 10 years ago. In that case, television reporter Julia Sandidge was seriously injured when she was punched in the head by a rioter. She was left unable to walk for two months. Sandidge told the Minneapolis Star Tribune that the crowd turned on her and a cameraman. She said, "It does happen very quickly. You really can't anticipate how it's going to happen." She said rioters saw her as part of the establishment. "We were there and they were angry," she said. "They saw us more as the arm of the law than as an unbiased journalist." Sandidge eventually left the daily news business, burdened by stress. She said the assault changed her perspective. She began to identify with victims. "We'd cover crime and show the video on the news and not take into consideration the victim's family watching that," she told the Star Tribune. "I'd feel grief…I'd go home and cry myself to sleep at night." Sandidge said she frequently shows video footage of her attack and its aftermath to journalism students. "I like to let young wanna-be reporters see what they are up against," she said. Tips: Wear clear identification. Carry a cell phone. Store an emergency bag in your trunk with a change of clothing, bad-weather gear, a flashlight and a first-aid kit. In potentially dangerous situations, such as a riot, wear footwear and clothing that allow you to move quickly. Consider protective gear, such as a helmet. If journalists are being targeted, get to a safe location.